I love to eat. I love it so much that I do it every day. When Nashville was announced as the location of this year’s Craft Brewers Conference, I knew I had to go. Sure, I’m continually trying to stuff my large head with more brewing knowledge, I wanted to see some old pals, and drink some amazing beer. But the part of the trip I planned out with the most detail was the food. In particular, I had a fire burning in my belly that could only be extinguished by more heat. In particular, the spicy, juicy, deep-fried poultry from Prince’s Hot Chicken Shack. 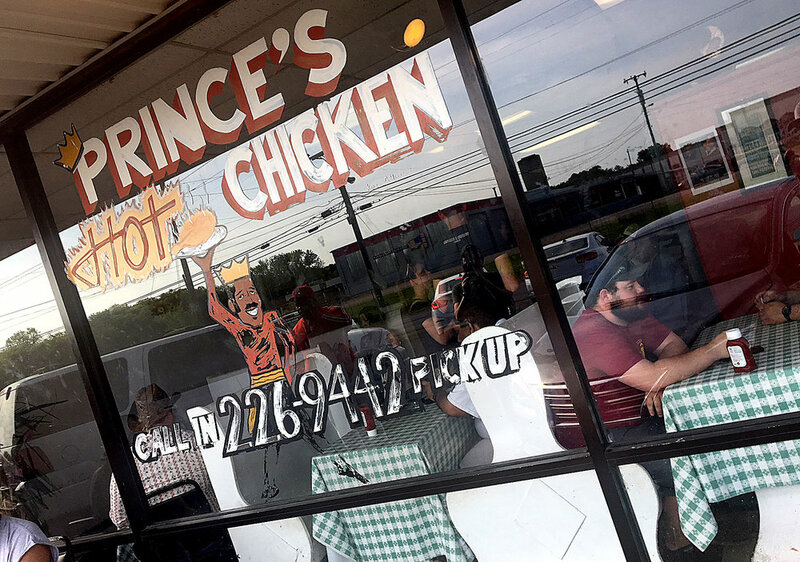 For those who aren’t up-to-date on your hot chicken history, Prince’s is the original hot chicken shack. The Big Bang of spicy battered bird. A piece of culinary history. Before I got could handle the heat, I had to warm up with my taste-buds. My culinary vacation started before we left the midwest. We met my niece (and her handlers) at Nutmeg Brewhouse in Burnsville on the way to the airport. It was a very good meal, but I can’t even remember what I ate. My mind was on two things: 1) Prince’s and 2) getting my glasses and hat back from Jocelyn. Once in Nashville, my tastebuds woke up. The coffee shop next to our loft, Frothy Monkey, made me one of the best Americanos that I can recall. The sandwich was also delicious, but man that coffee was good. My food frenzy was off to a good start. The days and times blend together, but at one point I found myself at Martin’s BBQ. Of course I couldn’t choose just one thing to try, so I got the platter. This baking sheet full of food hit my tastebuds with the best brisket of my life. The pork was also unbeatable. They know how to work that smoker. I paired my mound-o-meat with a smoked porter from Yazoo Brewing, which was just a few blocks away. I understood why there was a line out the door. My next memorable meal was devoured before I could snap a pic, but I paired the Indian food from the Chauhan Ale & Masala House with a Saffron IPA from Nashville’s Mantra Artisan Ales. Here’s a boring picture the beer, taken on a beautiful night with open windows in the background. Of course, I had to eat a hearty breakfast to fuel my mind and body every day to make the most of the conference. My favorite breakfast happened at 417 Union, just a block away from our room. I kept up with the self-gorging by ordering the chicken friend steak. If you’re gonna be a bear, be a grizzly, right? And then, the day came. It was our last full day in Nashville and I hadn’t cried from the heat of any meal yet. I skipped lunch, knowing that I had to get that burning bird! I hopped in an Uber immediately after our last class got done at 3:30, in hopes the never-ending line at Prince’s would be minimal between lunch and dinner. It wasn’t out the door yet, which I considered a win. After perusing the menu, I settled for a half-chicken. More food than a doctor would recommend, but I was HUNGRY. Then I had to decide the heat level. I like spicy food, but the heat here is legendary. Some say that even the mild can bring a bring a man to his knees. I got brave, and went with medium. What have I done? Forty-five minutes later, my order was ready. I was prepared for the wait, and knew my patience would be rewarded. The tiny strip-mall hotspot didn’t have an open table, so I took it back to our loft. That’s probably for the best, since I don’t like crying in front of strangers. I took it up to our rooftop patio and unveiled this deep-fried Mona Lisa. Each piece of chicken rested on two slices of white bread, which served as a sponge to soak up the extra grease and seasoning. The bright red bird had pickle slices on top, which was presumably there to help cut the heat, and I had my tallboy of Yuengling to help put out the fire. I also had napkins. Lots of napkins. The next 10 minutes were a blur. When I snapped back to reality, my plate was clean, my beer was empty, and my mouth was burning. Medium turned out to be the perfect choice for my palate. Yes, it was spicy, but I could still taste the deep flavor that the cayenne and other spices brought to the culinary masterpiece. The breading was crisp, the meat was juicy, and my heart was full. I could understand why this was the recipe that so many chefs try to recreate. Well done, Prince’s. After a short walk to help regain consciousness, I had a Maibock on our roof for dessert. Smooth, malty, full-flavored dessert. The following morning, I had one last Americano from Frothy Monkey, along with a massive breakfast bagel. My last meal in Nashville. Without thinking, I ordered a beer once we got through security at the airport. Shortly after my first sip, I caught a glimpse of my watch. To my surprise, it was 10 am, but the rules of space and time don’t apply at airports. So I had another one. Our bellies were full, our feet were tired, and our brains were fried. PS. Here are a few pictures from the conference to prove that I did, ya know, learn things. We sponsored a pair of bikes for the new Mason City Bike Share and are very excited/honored that the launch event for the bikes was held at Fat Hill on May 3. Thank you to all the awesome folks who worked really hard to make the bike share happen (Healthy Mason City and the Active Living & Transportation Commission)! For more info on the bike share, click here for a story KIMT did last week. We have such amazing customers. Thank you all big time for showing such support for the important work of the National Multiple Sclerosis Society last Saturday. With $1 per beer donated between noon and 5 PM, all the tips from noon from 5PM, and from online donations to our Virtual MS Walk FHB Team Page, we raised $416 for MS research. Wow! Thank you! I still get pretty excited when I see my name and Fat Hill listed together! 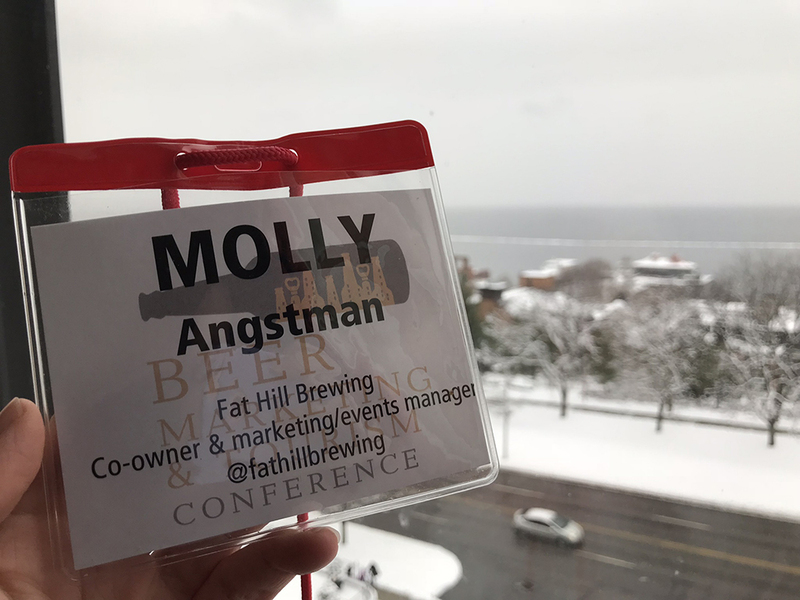 I just returned home from a great week at the Beer Marketing & Tourism Conference in snowy, beautiful, super-friendly Vermont. It was a very busy few days of beer tasting, networking, listening to speakers, and trying not to buy all the cool-but-expensive things that we don't need from all the vendors at the brewery trade show. My favorite part of the conference was talking to other brewery owners and learning about their businesses. In New Jersey, by law you must offer every patron in your brewery a tour, for example. Fun fact! There were folks from all over the country at the conference and some international folks too. I chatted up everybody! Especially fun to talk to were the French Canadian folks. They said (in their great accents, btw) that a trend there is "B&Bs" - beds and beers, rather than beds and breakfasts. I love that idea! 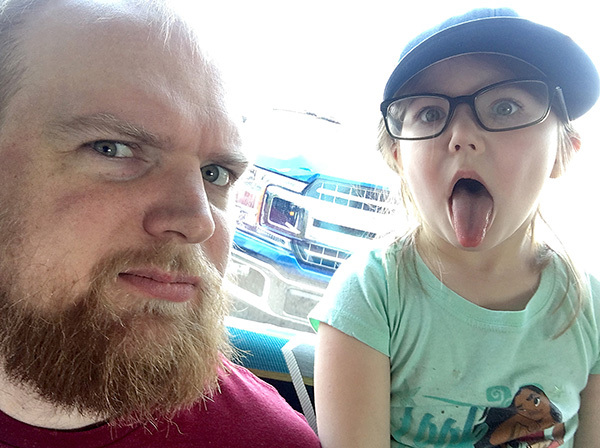 A lot of the business/marketing sessions at the conference were "sanity checks" for me and let me know that Fat Hill is doing a lot of things right. We're a very new business so that was an awesome relief to hear. Other than that, I came home with a lot of little behind-the-scenes tips and tricks normal customers probably won't see happening but will make the business/marketing side of things run a little smoother for us as small business owners. 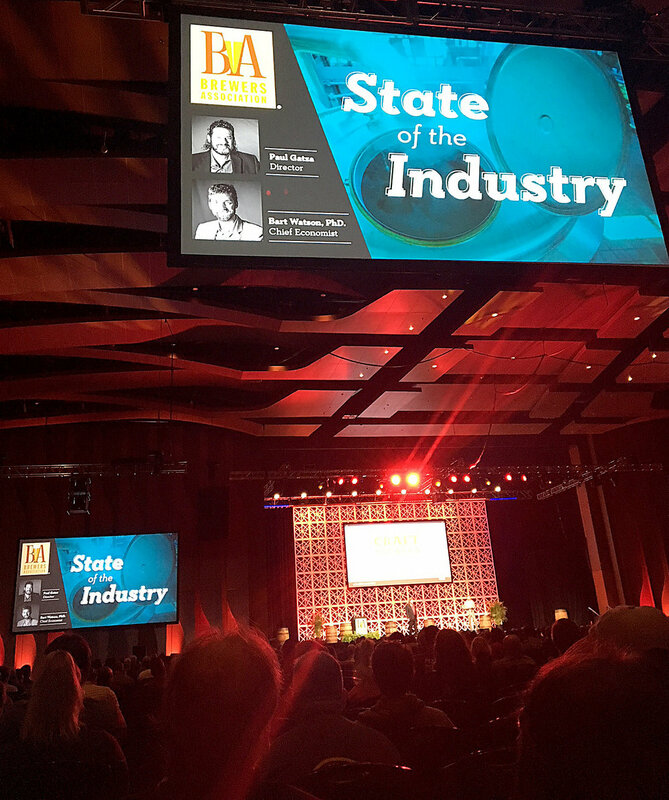 Picture of a marketing session stolen from the conference website. Thanks guys! The governor of Vermont gave the conference welcome speech. That might sound like an odd booking but craft beer is big business in Vermont. They even deregulated some stuff a few years ago (not sure when, maybe it was always this way) that makes it easier for small breweries to compete against big beer companies when they distribute. (Rare.) Beer tourism is also big in Vermont. He reported that according to the web stats of the Vermont's official tourism website, it looks like 25% of visitors to the site are interested in the state primarily for the craft beer scene, and then other stuff is second (skiing, history, hiking, etc.) to them. I had so many awesome beers during the trip. I'm a hop head so the IPAs from Prohibition Pig in Waterbury and The Alchemist in Stowe both made me very happy. Magic Hat also had an just-malty-enough English Mild that I loved. Another standout would be Pow Pow by Trillium Brewing (but they are from Boston, not Vermont) that is like licking a hop cone. So much good beer! One awesome awesome awesome thing about this particular conference was that it was made up of about 50% women attendees. In my experience in the beer industry this is a rare thing and it was fantastic to have that kind of camaraderie I don't usually have at beer conventions. There were a lot of productive, nuanced discussions about women in beer and women as an emerging market. Albeit much less frequent, there also were some less nuanced and not-at-all-productive discussions. We have a long way to go before this industry is 100% female friendly but I do see things slowly getting better. As far as taprooms go, due to the conference schedule I didn't have a lot of time but I did very much enjoy my flight at the vonTrapp Brewery in Stowe. Super friendly staff and the setup there is amazing...a huge lodge type building in the middle of the mountains. Views for days! Beer was great too - lots of Austrian/German influence, which is great for me because my undergrad term in Austria (feels like a LONG time ago) was when I started to like beer. Unfortunately, the days/times didn't work out with Hill Farmstead, so that's still on my To Do List. KIMT needed someone to interview for a story on aluminum and steel prices so they popped down the street to interview our own Brewer Jake! Thanks, KIMT! Attention, Rongorongo NEIPA fans! Sometime between now and Saturday, please vote for us in the Iowa Beer Blog 2018 Iowa IPA March Madness tournament bracket! 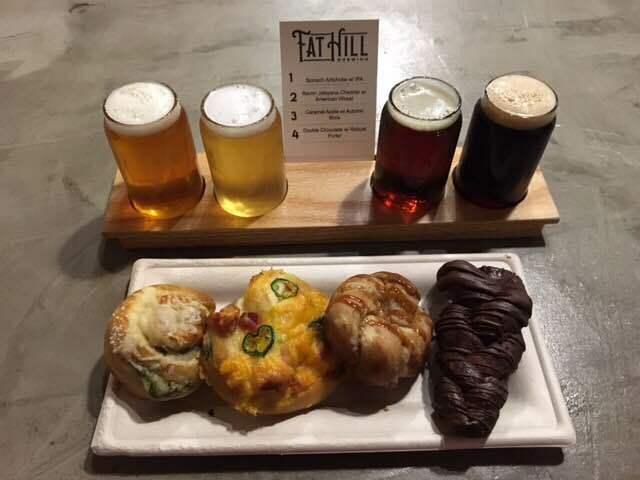 However, we love Alluvial Brewing big time so no hard feelings if you vote for the other guys. Click here to vote! By popular request, it's time for Bourbon Barrel-Aged Braggot, crowler edition! Q: Why are these crowlers special? A: Special size (750 ml), barrel-aged label, and rare (only 150 were made). Can be enjoyed now or aged. A: These crowlers were purged of oxygen and filled from the bottom, meaning they can be aged for several years if they’re stored at cellar temp (65 or lower). We’d recommend trying one now and sticking one in the cellar to see how the flavors develop and round out over the next year. If you’ve never aged beer before, this would be a great one to start with. A: This sweet, boozy style dates back to 12th century Ireland and combines the most delicious characteristics of mead (honey wine) with the humankind’s greatest achievement - beer. A: It's on the sweet side, as it was brewed with 360 lbs of clover honey. The honey note blends perfectly with the vanilla, coconut, and caramel flavors created by the charred American oak used to make bourbon barrels. Q: Where did you get the barrels? A: The barrels are from J. Carver Distillery in Waconia, Minnesota, which is our brewer's home town. Q: How many do you have left? A: We sold a lot on release weekend (Feb. 3) but we have plenty left. Come and get 'um! Limit 3 per person per day. $20 each. If you’ve walked down our hall and taken a peak at our barrels, you may have noticed some white gunk on our barrels. That white gunk is paraffin wax, a vital guard against messes and wasted beer. We use several different varieties of spirit barrels to age our beer in, several of which are at least 10 years old. Some started their life as bourbon barrels, where they sat aging that Kentucky gold for several years, before taking on a second act making treats like Port wine or Scotch. After all this wear and tear, sometimes they leak when the humidity is too low. That’s where brewers use wax, toothpicks, garlic, steam, pitch, nails or black magic to keep the heavenly liquid inside its oak dungeon. Our brewery book club has met once a month for a year now and we're ecstatic to report that its thriving. We are always surprised by how many people commit so much of their time to reading the book and showing up to have a beer and share their opinion. It's been a really fun way to get to know people and learn new things. Thanks so much to everyone who has attended or supported FHB Book Club this year! Our reading list for 2018 drops Thursday. Hope you're all excited for another great year! Hollie and Brian, our winners! We had a fantastic time yesterday at our first holiday party! Big thanks to the Over the Hill Brass Band for the festive tunes and everyone who donated to support their cause of music education. Our ugly sweater winners were Hollie and Brian Meyer for their handmade beer holder sweaters. Hollie’s even had a crowler holder complete with a FHB crowler. (We are not immune to adorable pandering!) Honorable mention goes to Dawn Siefken who made herself into an amazing holiday fireplace (complete with an elf on the shelf) and Joey Golly who dressed as sad-bunny-Ralphie from A Christmas Story. Earlier in the day we also hosted a local hand-made gifts fair. Pictures of the fair and band and ugly sweater participants below. We've gotten a lot of these questions in the last week so here are all of the answers in one spot. We're so excited about this beer, as its our first barrel-age release. A: Special size (750 ml), new label, and rare (only 100 were made). Can be enjoyed now or aged. A: It's an island off the west cost of Scotland, in a region famous for whisky production. It's pronounced "EYE-luh." Q: What does this beer taste like again? A: The lion's share was sold last weekend but we have some left! Limit 3 per customer per day. Mason City, your costumes are amazing and Saturday night was so much fun! Our staff-favorite costume contest winners are Cindy and Web Graves for their Hitchcockian "The Birds" outfits. We couldn't get over all the tiny details and Web's dangling eyeball. Thanks to everyone who came in tonight to celebrate Halloween with us! Thanks to Grandma's Cupcakery for the amazing cupcakes! We have a lot of people to thank today! Feeling very grateful that this event went so well! Through ticket sales for soft pretzel flights and tips at the bar tonight our awesome customers raised $934 for Crisis Intervention Services here in Mason City in honor of Domestic Abuse Awareness Month. We'd like to give a shot out to Mad Batters Bakery, maker of amazing pretzels (shown below), Paul Weitzel who donated his musical talents, and all these great sponsors who donated door prizes: NIP Fitness, Z'mariks, Lorado's, State Street Deli, The Quarry, Little Chicago, LD's filling Station, Lucy & Olive. What pairing was your favorite? The money raised will benefit CIS and their mission to provide persons affected by domestic violence, sexual assault and homicide with professional, confidential, 24-hour services including safety and support and to prevent violence in north Iowa communities through education. Molly didn't have anything purple to wear so grabbed a purple ribbon instead! Thanks to everyone for a great night. There are already plans in the works to do something similar next year! We are pretty excited about our first ever wet hop beer, which is the Wet Hop Session IPA that is out this week. We love this beer and are so glad we made it, but have jokingly nickname it the "logistical nightmare beer." 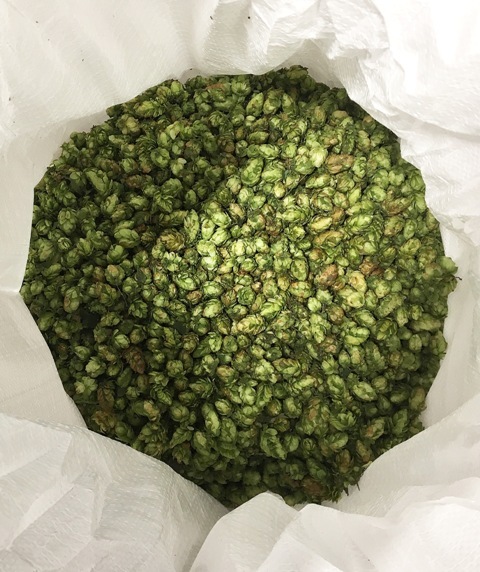 For those of you who don't know, most beer is made with hop pellets or dried cones, which have a long shelf life if stored correctly and are pretty easy to transport and store, but still have that lovely hoppyness that (most everybody) loves. When a brewer makes a wet hop beer, he or she is using fresh-off-the-bine (hops are grown on bines not vines, fun fact!) hops. The fresh hops have an extra earthy-citrusy-grassy smell and taste that you don't get with pellet hops. The hop picking, hops pick-up, and drive time were all coordinated with Jake's brewing day, so at the right time Molly started north and dropped off the hops just in time for them to be thrown in the boil. We hope you like the new beer! 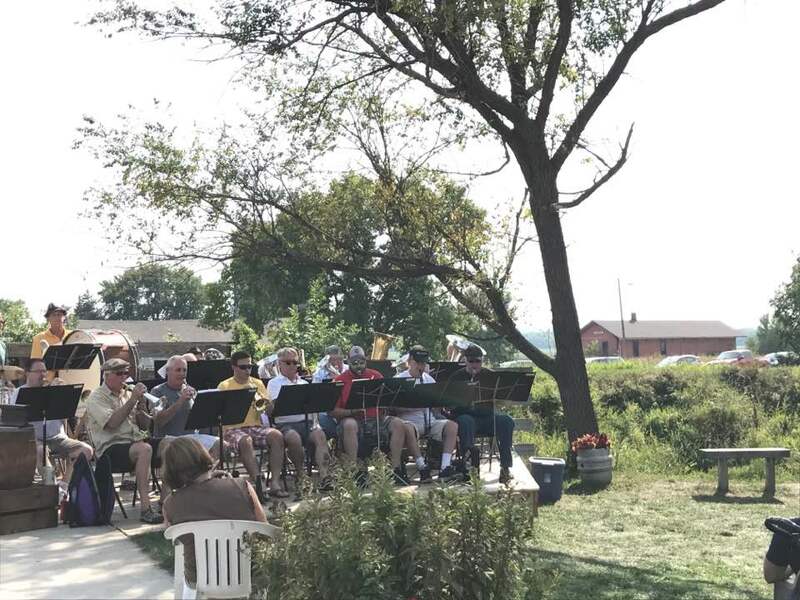 We would like to give a big shout-out to the Iowa Brewers Guild and Millstream Brewing for organizing/hosting the Festival of Iowa Beers that was held this past weekend in the Amana Colonies. It was a gorgeous day for beer drinking and meeting old friends! 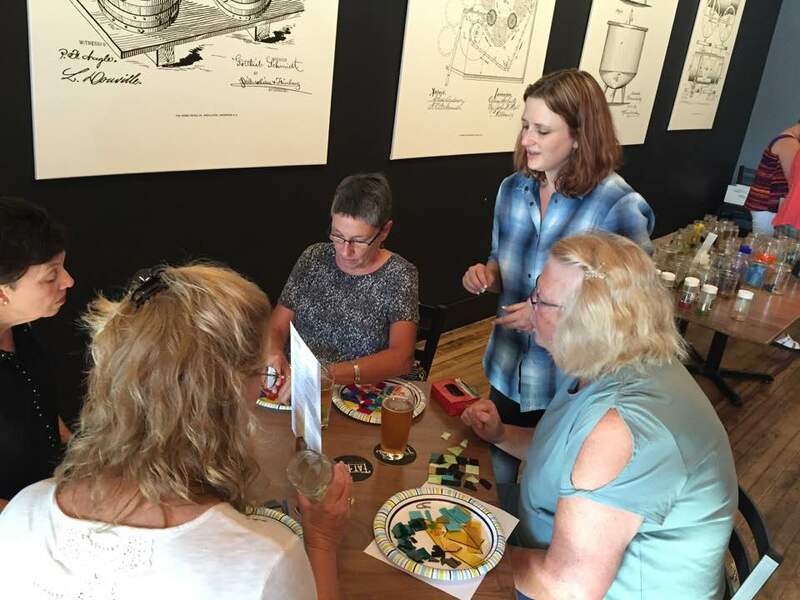 A big thank you to Market 124 for hosting a fused glass class in the tap room last night. It was fun seeing everyone's super colorful creations! 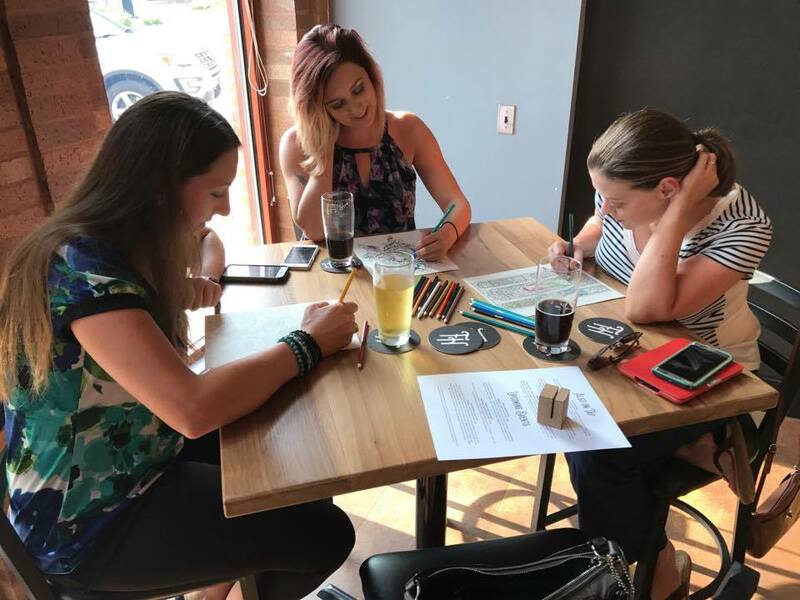 FHB celebrated Harry Potter's belated birthday by hosting a HP coloring night on August 2. We can't get over how good these costumes are! More photos of HP fans coloring below. Thanks to bartender Jessie for all the great pictures! It took a very long time but our make-shift DIY logo sign is finally up! It's been quite the journey getting the darn thing finished and on the wall so we thought we'd share a bit of behind-the-scenes goodies here. First, we bought some big pieces of foam board at Menards and drug it back to the brewery while it was flapping around in the truck (while it snowed). Next, we projected the design on to the foam boards and then used a Sharpie to draw in the lines. Then we borrowed Molly's dad's saw and Molly got to use her first-ever power tool! Worked great. Very exciting. Purple foam lint freaking everywhere. We were shocked it didn't look awful. Then it was time for a beer. The most labor intensive part of the process was that we covered the whole thing in duct tape. We wanted to 1) make sure the two pieces of foam board stuck together and 2) create a crazy texture and 3) didn't really think about any other ideas besides duct tape. We'd probably do something different if we were to do this again. Last step was to cover the whole thing in several generous coats of random paint that was laying around. We lost track but we think it cost around $40. Not bad!!! We'll replace it with something fancy whenever it falls apart. For now, please enjoy our small business shoe-string budget mega sign. We kinda like it!